Romantic, cute and cuddly. 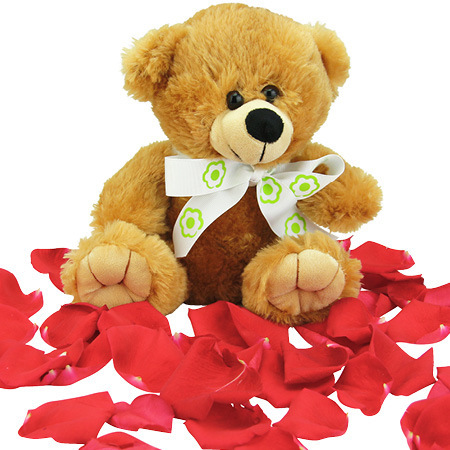 Surprise your sweetheart with 6 long stem red roses and teddy bear for Valentine`s Day! Red roses are the perfect way to express love and passion, but our soft teddy bear adds an extra adorable touch for the awwwww factor. No matter what your age, a cute teddy arriving on the doorstep always gives one a warm, fuzzy feeling of being loved! It`s time to tap into your inner-Cassanova! Order your luxurious, long stem red roses and teddy bear for Valentine`s Day Sydney delivery via this online store, email our fabulous love cupids at sales@flowersforeveryone.com.au or call directly on 1800 66 66 46. 2019-02-21 Service rating : Great flowers, delivered on time and on a short notice. Product : Pricey but it was Valentine`s day and I was overseas so the fact that it could be delivered on the day was key. 2019-02-21 Service rating : Following the delivery delay due to it being Valentine’s Day and multiple system errors, both my fiancé and I were very well compensated for the delay. It was very much appreciated. 2019-02-19 Great experience, I bought flowers for my girlfriend who current lives and works in Australia, it was easy to navigate and she loves the flower and bear package thanks. 2019-02-18 Service rating : I get flowers delivered to Sydney CBD, they are continually VERY late - right on or slightly after 5pm. Almost ruined valentines day - will use another florist in future. Product : Nice looking Teddy, decent roses, decent price. Thank you 5 stars.